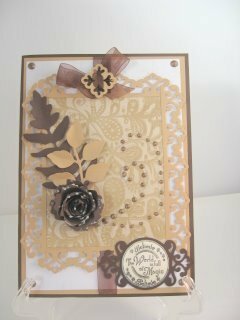 Buying these tiny items can be so expensive and also when you come to make the card you may not have just the right colour for the scheme you have chosen. But if you have some alcohol based marker pens then it is no problem to change your pearls to what ever colour you want for your cards. 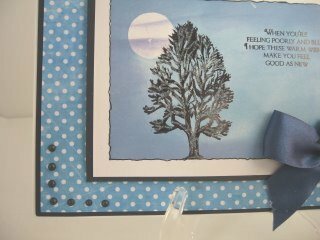 The video tutorial will show you some ways to alter these shop bought pearls and gems for you to add to your cards. But if you don't have some then they can be so easily made with just some Acrylic glue. Remember that there are all qualities of this type of glue and not all of them will give you the same effect. It needs to be a thicker glue to maintain its shape as it dries and it will need to be left over night to dry fully. The one I have used is Cosmic Shimmer and it is a really good thick glue that will give you the finish that you want. You can get coloured glues from many outlets that you can find on line. I buy mine from Creative Expressions and there are an amazing collection of colours for you to choose from. You can dot the glue onto an old peel off carrier strip to dry and this is a good way to store them as they dry or until you need them. Colour them to suit your chosen scheme... or add glitter or mica powder to them before they dry for another look. Then once your confidence grows you will add them directly to your cards. Varying the pressure on the sides of the glue pot will give you different sized dots as you squeeze. 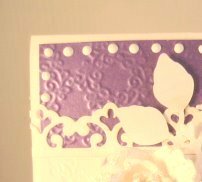 Try making your own flourishes too and add them to your cards for a really special look. Create heart shapes, leaves, musical notes, money signs or just squiggly lines ... which look really pretty in the Glitter Cosmic Shimmer Glue. And if you feel adventurous then you could even create someones name for a really personal touch. Playing is the best way to create your own pearls and to find out what works for you... and don't forget that practise makes perfect.